I teach drum lessons out Fort Knox Studios in Old Irving Park as well as my home studio in Oak Park, IL. My lessons focus on drumming fundamentals including rudiments, stick movement and control techniques, reading, and developing the muscle memory to play with confidence and consistency. I feel it’s important to build a strong foundation on the snare drum and then apply those as musical concepts to the drum set. I work with students, depending on their needs, to create custom lesson plans and benchmarks. I record my students or take videos to help retain and embed the material. Warm-Ups and Snare work including stick control, rudiments, and reading. Drum set work including auditions or school prep work, learning new rhythms, and applying concepts to the set within musical form. 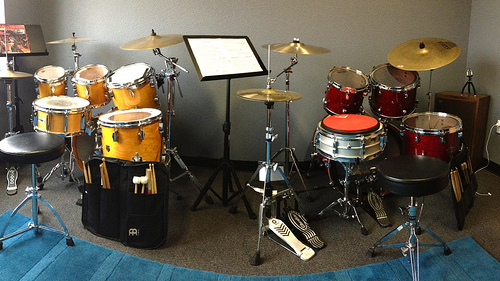 Drum set play along tracks, charting student choice songs, composition and improvisation. While I was at the Drummer’s Collective I was fortunate to study the Moeller Method with Jim Chapin. That experience along with my interest in natural drumming lead me to the Alexander Technique, which teaches people how to inhibit using unnecessary levels of muscular tension. It’s helped me tremendously and I utilize it in my everyday life as well as while I’m teaching drums. I’ve worked with students of all levels to identify tension areas and have helped drummers learn to play with more fluidity and less chance of injury. Although I like to challenge my students to grow and encourage routine practice, I also feel that music is essentially meant to be fun. That said, my job is to find out what the student’s areas of musical interest are and use those as departure points to broaden their musical skills. The balance between disciplined practice and just simply playing creates a nurturing and challenging learning experience. To play is a privilege and music is the best. So practice and then just go for it! After the first lesson, lessons are scheduled weekly and purchased in monthly packages (Paypal and checks accepted), prorated for the number of weeks remaining within the month. Check out some of David’s students!